The seventh annual John F. Scarpa Conference on Law, Politics, and Culture: Living the Catholic Faith in Public Life was held on Sept. 14 at Villanova University School of Law. 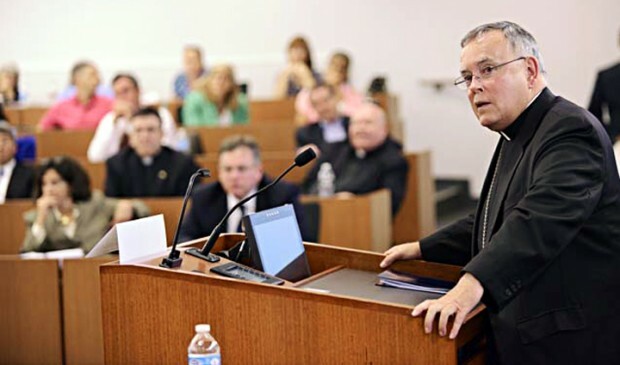 Archbishop Charles Chaput delivered the keynote address. Speakers included Helen Alvaré (Associate Professor of Law, George Mason University School of Law), H. David Baer (Associate Professor of Theology and Philosophy and Department Chair, Texas Lutheran University), Gerard Bradley (Professor of Law, Notre Dame Law School), Patrick McKinley Brennan (John F. Scarpa Chair in Catholic Legal Studies & Professor of Law, Villanova University School of Law), Reverend Bryan Hehir (Parker Gilbert Montgomery Professor of the Practice of Religion and Public Life, John F. Kennedy School of Government, Harvard University; Secretary for Health Care and Social Services, Archdiocese of Boston), Peter Steinfels (Co-Director of the Fordham University Center on Religion and Culture, University Professor at Fordham, and religion columnist for The New York Times), and Michael J. White (Professor of Law and Professor of Philosophy, Sandra Day O’Connor College of Law, Arizona State University). The annual conference is named for John F. Scarpa, in recognition of his generous support of Villanova University School of Law.